That used to be a frequent question at the checkout, and often still is. Many of us choose plastic since those little bags with handles hold so much and offer us the ability to carry quite a few, easily, at one time. Recently, though, stores have given us the choice of purchasing reusable cloth bags in order to save the environment by not using plastic and saving paper. However, that presents us with the problem of remembering to bring the bags with us to the store, and so often, because of the busyness of our lives, we choose to ignore environmental good just to keep from adding one more “thing to do” on our list. I was guilty of this, until Sunday, when I visited the “Washed Ashore” project at PCC Sylvania campus. A visit to this project, which shows the harmful effects of plastic on sea creatures, changed my thinking about using plastic bags. Artist Angela Haseltine Pozzi, who headed up this project, said she wanted her life to make a difference, and I believe she is accomplishing that goal by not only using her artistic talents to create beautiful sculptures from garbage but to also tell the world how harmful plastics can be to the life in our seas. Many of the amazing sea creatures that God created are being harmed daily because of plastic ! Plastic pollution is a big problem worldwide and affects over 200 species. It is killing our seabirds, sea turtles, whales, seals, fish and coral reefs. Plastic is moving into the food-chain as fish and birds think it is food and ingest it. I, for one, was not really aware of all of this until I learned about it while visiting the “Washed Ashore” project. I will say that this information has now changed my thinking about using plastic bags at the store. For when I learned how many giant sea turtles die because they eat plastic bags that they think they are jellyfish, I decided I could do something to stop that from happening. So, from now on, I will carry cloth bags with me when shopping and maybe through doing this I can save at least one turtles life. 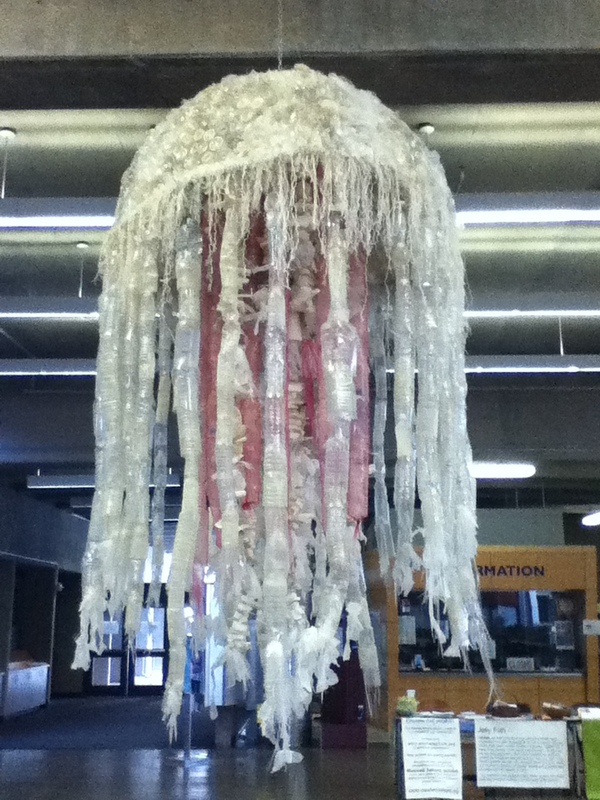 I would encourage you to visit the “Washed Ashore” project which is on display at PCC Sylvania campus until June 10th. This beautiful display of gigantic art carries a powerful message to all of us, to stop and think about what we can do to save all the wondrous works God has created.